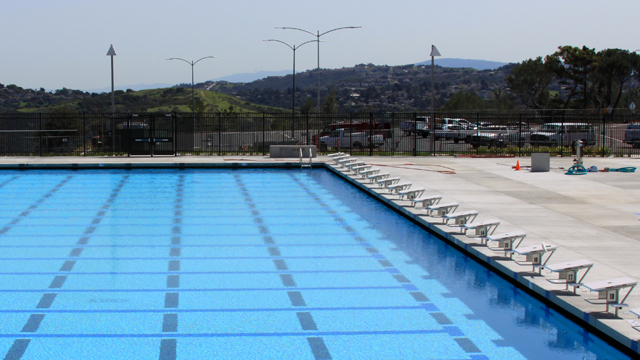 College of San Mateo's aquatic complex hosts two swimming pools. A 50-meter, 7-foot deep competition pool and a shallow bottom, 25-yard wellness pool. The facility also features a JumboTron Scoreboard with video capabilities. The competition pool has a temperature range of 78-80 degrees and the wellness pool has a temperature range of 84-86 degrees. The competition pool can host short or long course competitions, with a professional timing system. The pool can also be set up for any level of Water Polo competition. The wellness pool is a waveless pool in design, featuring 25-yards of staircase and a lift for easy access.